For those who have lost track of the scandal or are just tuning in, here is a timeline highlighting the major events and linking to articles with more information. What started as a $90,172 claim of inappropriate expenses seen as an outrage as part of abusive senate behaviour quickly escalated to a scandal with many more questions than answers. Get up to date with the full timeline. The independent Deloitte audit was found to be whitewashed by David Tkachuk, former chair of the senate's internal economy committee and by Carolyn Stewart Olsen, a member of the committee who was once Harper's press secretary. Stewart Olsen has recently been dragged into a scandal of her own, reimbursing taxpayers for inappropriate housing expenses. 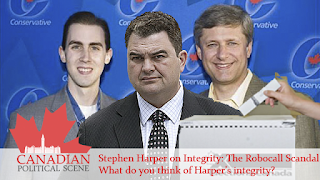 A binder found by the RCMP has raised eyebrows as Prime Minister Stephen Harper, among the Conservative brass, have repeatedly insisted former Chief of Staff Nigel Wright and disgraced Senator Mike Duffy didn't speak to each other prior to the $90,000 deal. The binder, formerly owned by Wright, featured calendars which gave details of Duffy's life over the past 4 years. Wright didn't give the binder when the rest of the information was submitted for review with the initial audit - nor was the binder given when the RCMP initiated their investigation into the deal. The discovery raises questions concerning how much the PMO, and by extension, Harper, knew about the deal. “The calendar is quite detailed and contains notes of Senator Duffy’s travel, meetings, teleconferences, social events, holidays, noteworthy current events, speeches, and political interactions,” Cpl. Greg Horton wrote in a court order. It turns out Wright compiled the agenda by having an open line of communications with Duffy, as alleged in an email obtained by the police written on February 20. "Mary and I copied and redacted my four years of diaries; added a summary of my days in P.E.I., and pics of the cottage under construction etc. 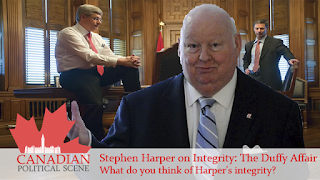 and sent it to Nigel by Purolator," Duffy wrote. Neither Wright or Duffy commented on the matter. The discovery of the mystery binder has only added fuel to the fire as new the calendars allegedly show Duffy contracted nearly $65,000 to a person to do “little or no apparent work.” The payments were made over a four year span to old CTV pal and former CTV human resources administrator Gerald Donohue - who retired in 1997 due to health reasons. Donohue said he gave Duffy advise on topics like "obesity" and "being a conservative," adding he would do a quick search on the internet to get options and give "verbal advice." Seemingly, nothing tangible has been given. No charges have been laid with this regard and the allegation has yet to be proven in court. A sworn document says Duffy charged taxpayers for speech writing work and media consulting services offered by Donohue. Donohue admitted he had no experience in either task. The fall session of Parliament is about to start. Harper may have prorogued to dodge opposition questions but given the latest developments, the questions keep gaining scope. What do you think of the latest developments? Share this article and join the discussion and let us know what you think: Facebook, Twitter, Google+.